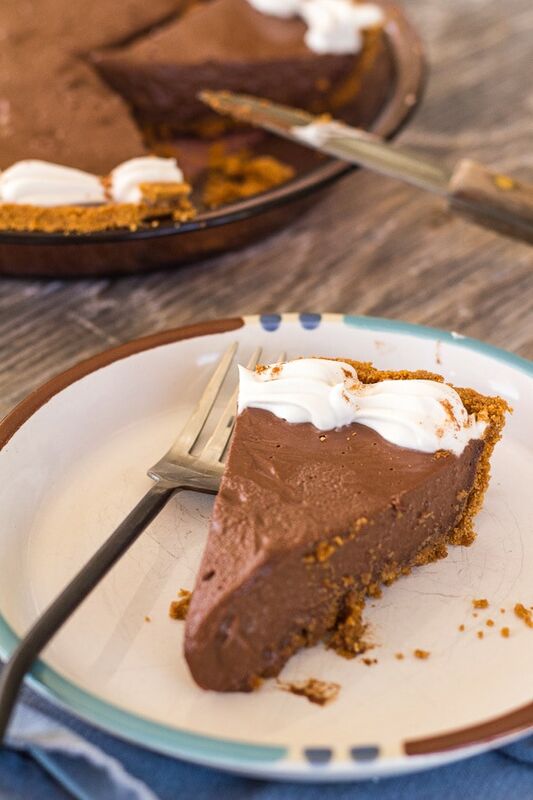 Deep rich chocolate, creamy with cashews and hinting of cinnamon, vanilla, and espresso, this dairy free chocolate honey pie with cinnamon graham crust is a new, better than ever, enhanced update of one of my long-time favorites. Today is National Dessert Day! For such an auspicious occasion, to celebrate, here’s a healthful cashew chocolate honey pie. 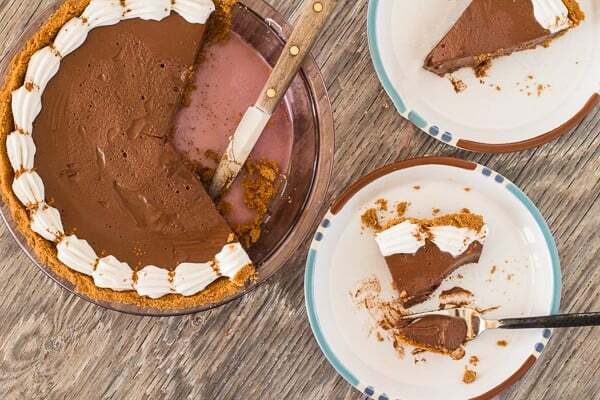 To make this pie, simply blend soaked raw cashews and water into cashew cream, adding Dutch process cocoa, honey, coconut oil, arrowroot flour, vanilla, cinnamon, and espresso powder. When the mixture is smooth, pour into a saucepan to cook a few minutes, whisking until the mixture thickens. Pour the hot filling into an easy pre-baked press-in crust made with cinnamon graham crackers, maple syrup, and vegetable oil. Pretty straightforward. Click here to PIN Chocolate Honey Pie with Cinnamon Graham Crust. When you blend hot water-soaked cashews with water, you get cashew cream. Blend with a little more water, you get cashew milk. 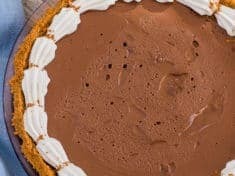 Cashew cream is what makes this chocolate honey pie so creamy! Cashew cream and cashew milk are riding the wave of awareness about the health benefits of plant-based diets. They’re perfect dairy stand-ins for milk or cream in vegan and dairy-free sauces and soups. Cashew cream is the creamy base for this vegan kiwi lime avocado pie, cashew milk enriches this flavorful spring greens soup. In keeping with the dairy-free cashew cream filling—this pie is finished with coconut whipped cream made with canned coconut cream. Substitute dairy whipped cream if you like. 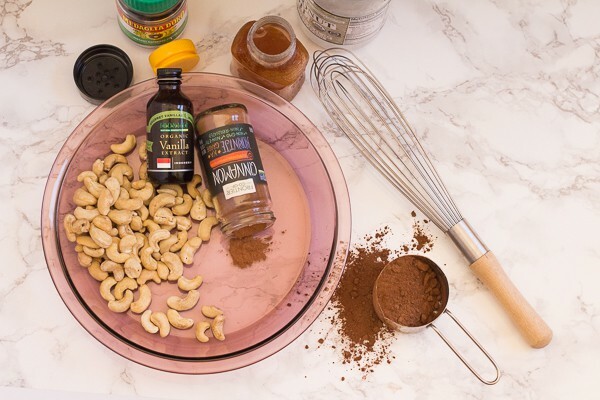 It’s not like cashew cream and milk are something new–they’ve been around in the health food world for quite some time. Way back in college, when I was a learning to cook with vegetarian whole foods, I used to make a basic arrowroot-thickened cashew pie from one of my natural foods cookbooks. In those days this chocolate honey pie was a carob honey pie. We now know that dark chocolate is actually quite nutritious. A bag of carob powder still lives in our pantry, though it hasn’t seen much use. Chocolate is much more satisfying! 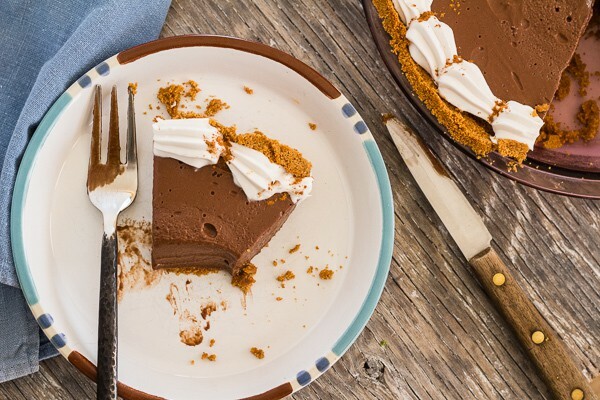 You will love this chocolate version of the original carob honey pie. A comforting creamy slice of this chocolate honey pie with cinnamon graham crust eminently satisfying. In fact, I ate a slice for breakfast today!! Carob powder is ground from a tropical tree pod. 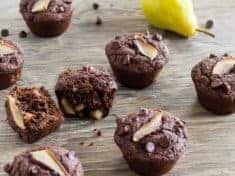 It vaguely resembles chocolate, and easily substitutes for cocoa powder. My best girlfriend made a honey-frosted carob cake for our wedding! Arrowroot is a tropical root plant. Arrowroot flour aka arrowroot starch is a completely tasteless, gluten-free, easy to digest white powder. As a thickener, arrowroot becomes clear when cooked. It’s a nutritious alternative to cornstarch and can be used in place of cornstarch in recipes. Arrowroot can make baked goods lighter, like in these honey lemon cupcakes. Make it vegan: Replace maple syrup or organic cane sugar for the honey. Make it gluten free: Substitute gluten free graham crackers, or make a gluten free crust, like this pecan crust. Wishing you a fabulous week–get in the kitchen and cook something chocolate! 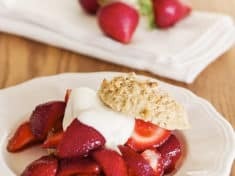 PS If you make this recipe and/or enjoy this post, please consider leaving a blog post comment. Your comments help other readers learn more about the recipe. Cashews, chocolate, and coconut oil together make a creamy dreamy pie filling, rich, but not too rich to eat for breakfast! Serve with the coconut whipped cream in this recipe, or with dairy whipped cream. Makes one (9-inch) pie--8 to 10 servings. Place the cashews in a bowl. Pour boiling water over, to cover. Let soak while you prepare the crust. Preheat oven to 350° F. In a food processor grind the crackers into fine crumbs. Mix in the oil and maple syrup, pulsing until incorporated. Press evenly into the pan, extending up the sides and forming a bit of an edge. Bake 10 minutes. Cool completely. Drain and rinse the cashews. 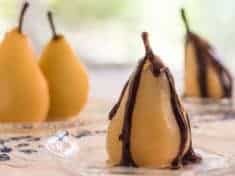 Put them in a blender with the water, coconut oil, honey, arrowroot, cocoa powder, cinnamon, espresso powder, and salt. Blend until very smooth, 3 to 4 minutes. Pour into a saucepan. Over medium-high heat, whisking constantly to prevent sticking and lumps, cook the filling 7 to 10 minutes, until fairly thick. Remove from the heat. Fill a large bowl with ice and nest the saucepan in the ice. Whisk the filling every few minutes, until cool to touch. Whisk in the vanilla. Pour into pre-baked crust. Cover with plastic wrap and refrigerate until cold, at least 4 hours. Serve with Coconut Whipped Cream, dusted lightly with ground cinnamon. Refrigerate or freeze a metal mixing bowl and whisk attachment for 15 minutes before opening the can of coconut milk. Open the can of coconut milk, being careful not to shake it. Scoop coconut cream solids into the cold mixing bowl. Reserve remaining liquid for smoothies. Beat the coconut cream on medium speed until soft peaks form, 3 to 5 minutes. Add honey and vanilla extract and continue beating until the cream holds its shape, another 3 or so minutes. Decorate the pie with a piped border, or dollop spoonfuls of cream onto each pie slice. You want the coconut milk to be very cold, so that the solid coconut cream separates from the liquid.